Welcome to the Artistic Outpost Design Team July Blog Hop! 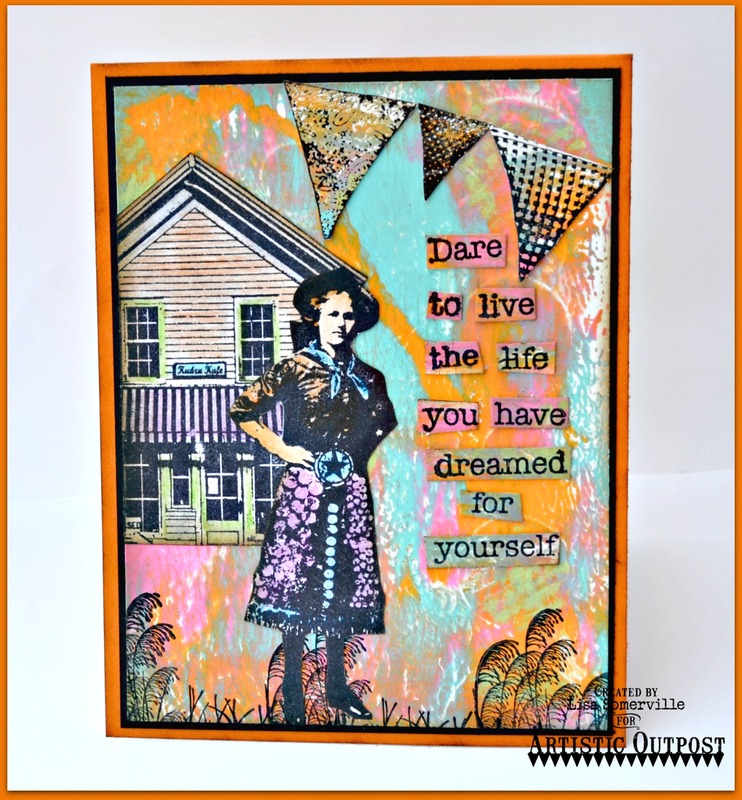 Each month, the fabulous designers at Artistic Outpost showcase projects created with various Artistic Outpost Plates/Themes, this months DT Blog Hop theme is Designers Choice. I created a Mixed Media card using the Artistic Outpost Keeper, Kudzu Kafe and Cowgirl Strength plates. To create the background panel, I applied DecoArt Americana Multi-Surface Satin Acrylic Paint in Flamingo, Coastal Waters and Orange Sherbet to my Gelli Arts Plate, then added the Dottie Stencil from Just a Trace. With the Stencil still in place, I stamped the bunting from the Kudzu Kafe plate in Citron Green then pulled my print onto Mixed Media Paper. The grass from the Keeper plate is stamped in Black Archival. The Cowgirl from the Cowgirl Strength plate, and the building from the Kudzu Kafe Plate are stamped in Black Archival on Vanilla card stock and colored with Staedtler Karat Aquarell Watercolor pencils, and adhered in place with Decou-Page. The Pennant Bunting from the Cowgirl Strength plate and the quote from the Kudzu Kafe plate are stamped on scraps of the mono print background, sponged with Ranger Gathered Twigs Distress Ink and adhered in place with Decou-Page. Don't forget, there's still time to enter the STAEDTLER Summer Prize Giveaway! Be sure to check out the 20% off Sale on the Flowers and Gardening plates at Artistic Outpost! AO's parent company, Our Daily Bread Designs and sister company, North Coast Creations are also having a sale this week! Love those bold brights! She works so well with the Kudzu Kafe, and the desert grasses around the bottom are fab. Wow, Lisa that background is so gorgeous and really makes the images pop! Love that cowgirl and sentiment! Lovely card! Oh, Wow! The colors just pop off the paper! I just love your cowgirl. Very bohemian...LOVE! She is just perfectly suited for those background colors! Lovely piece of art GF! Wonderful images, its a fabulous card. Wow I see such brilliant colors. Love this Lisa. I always drool over your beautiful Gelli plate backgrounds, Lisa. What gorgeous colors you have used this time. Love how you have combined elements from so many different stamp sets too. Seriously cool card for this month's hop. What a colorful card,Lisa!! I just love the sponged background and your vintage images!! Thanks for sharing it with the challenge this week!! Your support as part of the team is so appreciated.